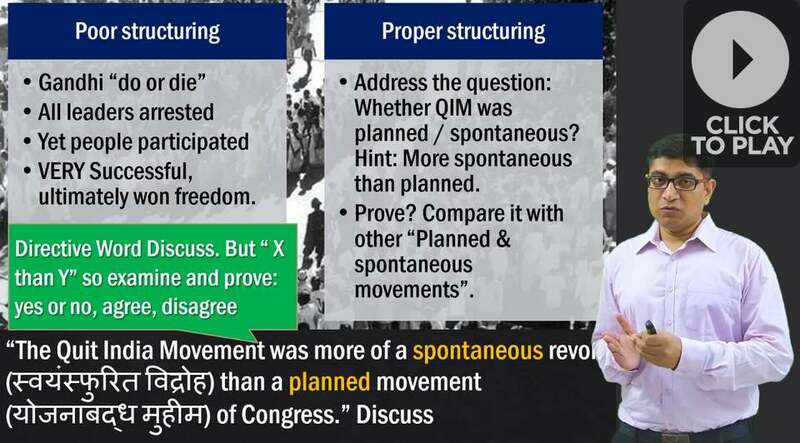 UPSC Mains Answer-Writing: Quit India was Planned or Spontaneous? “हिंद छोड़ो आंदोलन कोंग्रेस की योजनाबद्ध मुहीम से ज्यादा एक स्वयंस्फुरित विद्रोह था”. चर्चा कीजिए. When mentioning the abbreviations for the first time, give their full forms NCM, CDM, QIM. After the failure of the Cripps Mission, Mahatma Gandhi had decided to launch his third major campaigns against the British rule. 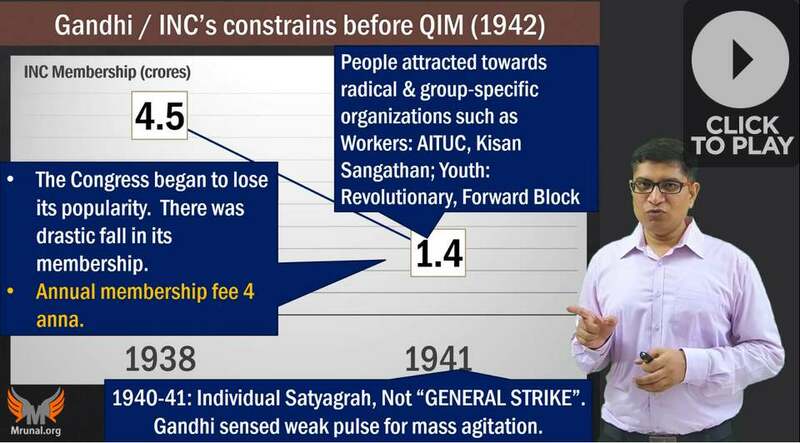 This ‘Quit India Movement’ (QIM) began in August 1942. They’ll chalk out the strategy, distribute the tasks. When senior leaders are arrested, movement would continue by the younger generation leaders. Example: CDM- Abbas Tyabji & Kasturba arrested before reaching Dharasana salt pan. But, march continued by Sarojini Naidu. In the similar fashion, QIM was approved by Congress Committee at Bombay on 8th August 1942. On the same day, Gandhi gave his call of ‘do or die’. However, Gandhi and all other important senior leaders of INC were arrested on 8th and 9th August. Still, Jayaprakash Narayan, Ram Manohar Lohia, Biju Patnaik, Sucheta Kriplani, Aruna Asaf Ali, Usha Mehta (Congress radio) and other leaders of younger generation carried on the agitation. To earn more marks, you’ve to sprinkle the factual masala. Leaders names are necessary. but QIM movement was marked with unprecedented violence & underground activities. E.g. removing railway tracks, looting treasury, blowing up bridges, burning post-office & police stations, cutting telephone lines- which is not a characteristic of planned Gandhian movement. Parallel governments were setup in many parts of countries. Bengal: Jatiya Sarkar; Maharashtra: Prati Sarkar. It proves that while Congress and Gandhi enjoyed symbolic legitimacy over the movement, but they had little control over these activities done by local groups on their own volition & initiative. Hindu Mahasabha and Muslim League supported British war efforts. Since Soviet Russia joined the Allied forces, Communist Party of India did not join QIM because this ‘Imperial war’ had become a ‘People’s war’! Although mill-owners and workers joined in some parts. Dr B.R. Ambedkar had recently joined Viceroy’s executive council as labour member & did not join QIM. It shows that neither the jailed Congress leaders, nor the non-Congress leaders were coordinating the QIM once it was launched on the 8th August. Thus, despite the lack of centralized planning and coordination, Indians actively participated in large numbers. Lord Linlithgow had to use the help of army and arrest over 90,000 Indians to crush this movement. Therefore, some of the historians argue that QIM more of a spontaneous revolt than a planned movement of Congress. 0: if started with longwinded bowling from CDS, Dandi, Gandhi-Irwin, 2nd RTC or gave lengthy explanation of why Cripps Mission had failed. 0: if finished the conclusion in a single simple line- “…thus QIM was very successful which ultimately led to freedom of India”. Not more than 1 mark: If no leaders other than Gandhi mentioned. 0 if simply narrated the events that “Gandhi gave do or die, he was arrested yet juntaa participated in large numbers, it was very successful.” This linear narration is not asked. You’ve to prove how planned / spontaneous this movement was? (-1) if long explanation of why Cripps Mission failed. (-1) if appearing in vernacular medium, and yet used English terms such as “अंडरग्राउंड, मिलिट्री, अरेस्ट, लीडर”, instead of writing their proper translations. Don’t give yourself more than 4 marks: if conclusion doesn’t contain keywords from the question. No factoids, No leaders, no comparison. Simple narration: people participated in large numbers. Give yourself upto 8 marks: if proper introduction and conclusion, with logical structuring of how QIM was started- its elements of planning and elements of spontaneity, sprinkled with the factoids masala. Subscribe to Youtube.com/c/TheMrunalPatel for more videos on UPSC, and Visit Mrunal.org/Mains for more on the Art of Answer-Writing. very helpful in mains answer-writing prep.